You may not know it but today (21st April 2015) is “Bulldogs are Beautiful Day”. I suspect that this day came about because bulldogs are not often considered the most attractive of animals. Think about it:if someone told you that they’d seen a beautiful dog, I’d wager that you probably wouldn’t bring to mind the image of a bulldog. We’re not saying that bulldogs aren’t lovely creatures, they’re loyal and have (with the right conditioning) a lovely temperament. But still not an immediately attractive dog to many people. Now you might wonder what bulldogs have to do with websites. You see, when we build websites we build them to get results. And occasionally that means going against a few accepted website design conventions. But since a website is supposed to be a marketing channel, and not just a pretty brochure online, it takes a little while for some of clients to understand what we’re aiming at and why it’s important. What happens is that our clients are like bulldog owners; what they have might not look as everyone thinks it should but it certainly does what’s needed. That’s not say that we build unattractive websites. But if you’re considering having a website built you should always be thinking about ‘Return on Investment’ (ROI) first and (and here’s where the design fanatics start jumping up and down) aesthetics second. And, for the right reasons, it’s OK to have the bulldog equivalent of a website. 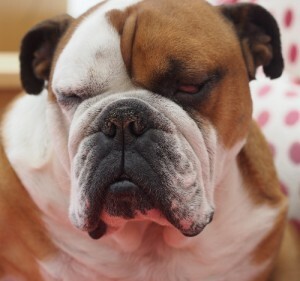 So, if you’ve thought that maybe your website is something of a bulldog (attractive to you but not necessarily everyone else) then give us a call on 0116 3552194 and we’ll have a chat.